"If your kids love Harry Potter, nothing is going to inspire them to get in the kitchen like this cookbook. Some of the best parts of the Harry Potter books are the rich descriptions of the holiday feasts at the Great Hall. With this book, your kids can make Harry's favorite dessert (treacle tart, of course). They can make the mince pies that Mrs. Weasley sends Harry every Christmas, and the pumpkin pasties from the Halloween feast scene I loved reading as a kid. They can even make Mrs. Dursley's pudding—the one Dobby destroys in the beginning of The Chamber of Secrets. As long as you don't mind your kids going down the weird meat-pie, haggis, and Scotch collop–filled path that is the world of British food, this book is sure to be a hit." "Manage all your kitchen mischief, such as Cauldron Cakes and Molly’s meat pies. We won’t tell if you pretend your mixing bowl is a cauldron." "This book could rightly be regarded as something like a portkey; to open it is to at once be transported back to a living world of … culinary delights. A pleasant stroll down memory lane with old friends. It’s a walk worth taking for many reasons, not least of which is the abundance of good eating to be shared along the way." 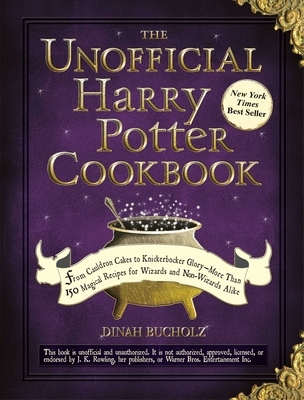 "If your loved one in a whiz in the kitchen, they’ll love the Unofficial Harry Potter Cookbook. This top-rated cookbook has recipes for all the classic Harry Potter treats, from Treacle Tart to Pumpkin Pasties. Maybe if you’re lucky, the recipient will share the magical results with you!" "Includes recipes for the fictional foods from the series, like cauldron cakes and treacle, and is a fun way to get kids interested in Harry Potter also interested in food." "Maybe you already have all seven volumes of Harry Potter, but do you have the unofficial cookbook? Featuring delicious recipes from the wizarding world, including Cauldron Cakes and Butterbeer, it's the only guide you need to throwing the ultimate Hogwarts-style feast." "The Unofficial Harry Potter Cookbook is filled with all of the delicious, magical recipes from your favorite wizarding world — and don't worry, they're all perfectly safe for Muggles. Let your mouth water at the thought of lemon drops, cauldron cakes, and pumpkin pasties, all listed with easy-to-follow instructions and context from the Harry Potter books themselves. For example, the lemon drop recipe … makes a reference to a conversation between Harry and Professor McGonagall … which is what makes this book so darn cool. Plus, the recipes … offer everything you could possibly want on any given day, focusing on a banana bunch of English foods that range from savory to sweet." "The food in the Harry Potter series has had us drooling for over a decade … but now you can finally make your own! The Unofficial Harry Potter Cookbook will have you performing absolute magic in the kitchen … . These easy-to-follow recipes are apparently delicious and don't require you to be a master chef either, meaning this is an essential book for yourself and for any budding chefs in the family. Time to dust off your cauldrons and get cooking!" "A truly brilliant idea that combines a beloved children's literary classic with an old-fashioned recipe book. Designed to look and feel more like a literary companion with excerpts from the books providing context for each recipe … your little wizard will be able to serve up a pint of freshly made pumpkin juice, then imagine he's sitting down to a feast in the Hogwarts dining hall." "This cookbook lets them recreate some of the gang's favorite meals, drinks, and sweet treats. It's got all the classics … plus it tells you exactly where in the books to find the references to each food."